Leutenegger's book, Kodak City, is a tour through the sleepy upstate New York city that Eastman set up shop in circa 1880. The images provide a sober look at the Kodak facilities and the surrounding people and places that live in their shadows. Throughout the series are melancholic collisions of a dilapidated corporate culture and the grandeur of industry. Even when Leutenegger takes her camera away from the Kodak buildings, you can feel its ghost lingering. Anyone familiar with the recent history of photography is aware of the tragic fall of Kodak—how despite being at the forefront of early digital technology, they failed to capitalize and were eventually swallowed by more forward-thinking competitors. Just as tragic is the loss that photographers who still shoot film feel as the precious materials necessary for the craft are in danger of disappearing all together. 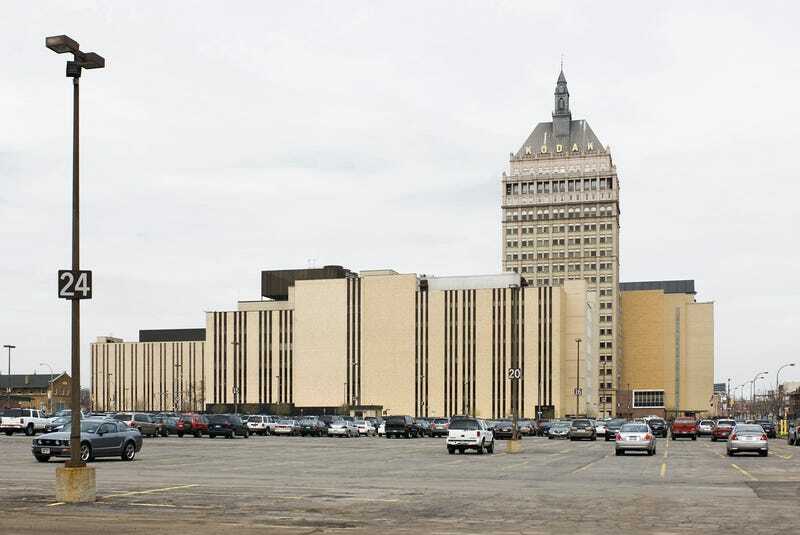 The problems of cities like Rochester go deeper than the plight of a single company, of course. It is not alone among neighbors like Buffalo and Syracuse whose manufacturing-dominated economies have taken hard hits in recent decades. Through the example of a giant like Kodak, a company universally recognized and even beloved, the consequences of technological shifts are brought sharply into focus. You can purchase the book Kodak City, published by Kehrer, on Amazon.